You are invited to contribute to Pharo - the amazing OpenSource immersive programming experience: Read more here. Smalltalk is the second most loved programming language - it ranks number 2 on Stack Overflow's most loved language. Check the survey yourself. is available now. Read more here or try a demo here. A few years back there was a Squeak project called "SqueakNOS" about a Squeak Smalltalk system that did not require an underlying operating system. The idea was that you can boot into the Smalltalk image without an underlying separate OS. So that means that nearly anything is based on/implemented in Smalltalk (drivers, etc) and Smalltalk becomes the OS itself. I was fascinated by this idea when an initial SqueakNOS system was available and if you follow my blog regulary you may remember that I also reported about it's resurrection in 2006. For Pharo Smalltalk later there was a similar project (at least with a similar name and idea) called "PharoNOS" by Mike Filonov (from pharocloud.com) to boot a Pharo system in seconds. Mike provided an ISO that you could easily boot on a machine or in a virtual environment like VirtualBox or other. But Mikes approach was not like the original "do it all in Smalltalk" project for Squeak as his "PharoNOS" variant used a TinyCore Linux with pure X server underneath and Pharo was running on top in fullscreen. Nonetheless I liked it too as I was able to boot a Pharo in seconds now without having to install a separate operating system. Nice for kiosk systems and others. But meanwhile also the original SqueakNOS (the Squeak system with no operating system) was ported to Pharo as "PharoNOS" and you can really have a "Pharo with No Operating System": Read more if you are interested as it was announced this week. While all this is primarily x86 based work one could think about an ARM solution. Some pieces are already there: remember that Pharo had NativeBoost allowing to generate and run machine code in Smalltalk. For the general Pharo release Native Boost required lots of knowledge and was hard to maintain as a general FFI interface - so it was replaced by a unified solution already (UFFI) in Pharo 5. Interactive search for zero with Newton-Raphson method with a small DrGeo Smalltalk script. DrGeo is written in Pharo. There are now many books available for Pharo. Now also a new book about building user interfaces with Spec is available. I just ordered a hardcopy on Lulu. Instantiations invites to Camp Smalltalk - RDU, March 31–April 2, 2017 in downtown Durham, North Carolina. Just for fun there will be a demonstration of VA Smalltalk running on the Raspberry Pi and every attendee will receive a Raspberry Pi Version 3. Camp Smalltalk is a great idea and now a tradition since 2000 when it started in San Diego. I'm not able to attend as North Carolina for a german is unfortunately not around the corner. Also I already have my Pi running with another Smalltalk. But registration is here if you are interested. Helvetica is ported to recent versions of Pharo. Read more. There is now a “Student” memership level for the Pharo Association. This gives a 50% discount compared to the standard membership. Read more. Pharo Consortium has been selected as mentor organization for for Google Summer of code (GSOC) 2017. Read more here as student and read more here as Mentor. Another success story of Pharo: from 2008 to 2015 ATMs (Automated Teller Machine) deployed in Moscow streets were developed and run using Pharo. As the bank is now closed for other reasons it is now possible to talk about used technologies in public. This reminds that is not unusal that the use of Smalltalk is kept as a secret or stay hidden behind the scenes. The development productivity in Smalltalk is much higher than in other more mainstream languages and with a dynamic and flexible environment once can quickly react to business changes. This gives a competive advantage and some business dont want to give too much info to their competitors. Smalltalk is often driving mission critical software - business dont want to tell too much about such software. A german Group for people that are interested in software develompent with Smalltalk have a meetup site. There is a new blog started by Maarten Mostert about VisualWorks and web development. If you work with UML, modeling tools or model data exchange often you might know XMI - the XML Metadata Interchange format. I wrote a little package that makes it easier to work and browse data based on this format within Pharo. Read more. 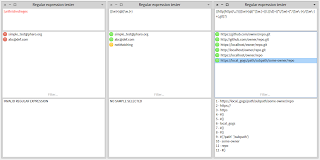 A little tool to test regular expressions and verify that given samples match it. It also helps to divide an expression into subexpressions to retrieve parts of a matched string.